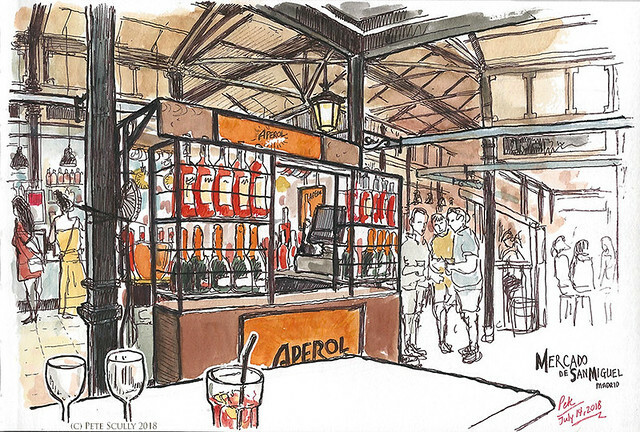 Not far from where we were staying in Madrid was the Mercado San Miguel. This covered market – well, more like a food hall – was chock full of fresh food and drink to buy and enjoy in a very Madrid atmosphere. We came here a few times for tapas, churros, sangria, but I decided it needed sketching so late one evening when the family went to bed I came across the street, got a sangria and some olives stuffed with mussels, and sketched the bustling gourmet mercado before going home at midnight. The red sangria was delicious. There were lots of tourists there, Americans dragging their sleepy teenaged kids around to experience late-night Spanish culture, some groups of English men on more sensible weekenders than the ones down at the Costa Brava, young ladies sampling Spanish wine and desserts, and occasionally a few locals too, I guess, or maybe visitors from other parts of Spain. I wasn’t really paying much attention to all the people and their conversations, I was looking at the ironwork on the ceiling. I did really enjoy this place, though it is very self-contained and not as large or diverse as the big market in Barcelona that I sketched in 2003. However it was a nice taste of Madrid, literally. Above is the Palacio Cristal, located in the Parque Dell Buen Retiro, the expansive green space in the heart of the city. We spent an afternoon wandering about here, among the trees and lawns, and we sat for a while by this lovely old building. This might have been my favourite part of Madrid. I sometimes forget in my rush to see big exciting urban wonders that I actually love great urban parks more than anything. I always loved Hyde Park, Regents Park, Central Park in New York of course. Buen Retiro (“Pleasant Retreat”) is exactly that, and dotted with great structures such as this, the Palacio Cristal. 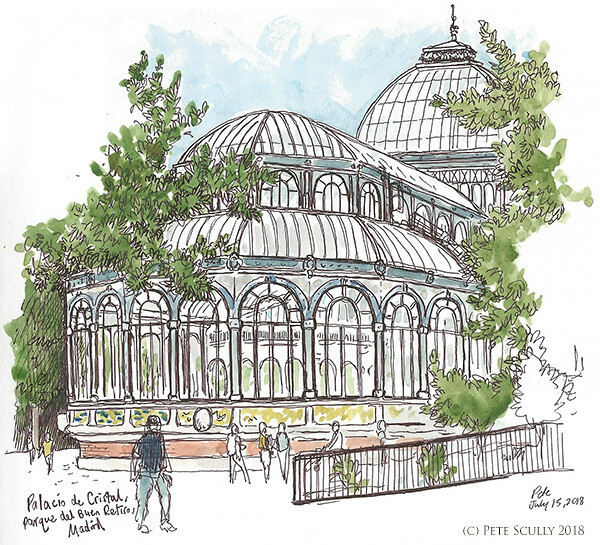 This was built in 1887 by Ricardo Velázquez Bosco, possibly inspired by Paxton’s great Crystal Palace in London. Unlike that one, this palace was never relocated to a southern suburb to become the name of a football team and then burn down, and it still sits pretty among the greenery today. I sketched it while we took a break from all the walking. There was a pretty steep street to enter the park, Calle Claudio Moyano, lined with second-hand book stalls and the occasional cold drinks spot, so by the time we reached the middle of the park our feet needed a rest. Well my son’s didn’t, he wanted to kick a ball around but had left it at the apartment. So, we drew this. Speaking of greenery, this is the Atocha train station, in Madrid. We went there to catch a train to Toledo, and were then delayed by the fact you need to wait in a long line to buy a ticket to Toledo. More like Delayed-oh. Sorry, that was a bad pun, even for me. 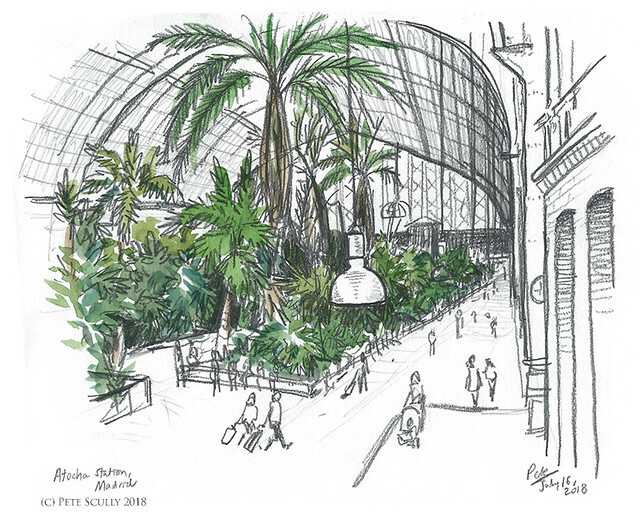 So, it gave me time to do a sketch of the incredible botanical garden they have inside the main atrium. This was also one of the stations where the awful terrorist attacks of 2004 took place, killing 193 people. The legacy of that atrocity is still visible in the fact that to board a train in Spain, or at least the ones we boarded, you need to go through security and have bags x-rayed. 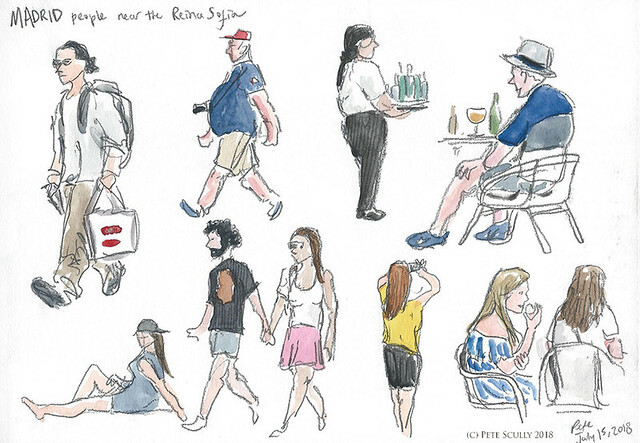 Here are some Madrid people, sketched while we lunched on pizza outside the Museo Reina Sofía. We spent all morning in the Museo Nacional Centro de Arte Reina Sofía, yet barely scratched the surface of this large art gallery. I was there first and foremost to see Guernica, Picasso’s huge classic, which paints the horrors of an aerial bombardment of a small Basque city by German planes late in the Spanish Civil War. It’s been one of my favourite paintings since I was at school, so to finally see it for real in all its vast, immersive terror was quite an experience. It was accompanied by lots of Picasso’s preparatory sketches, and other paintings by him and by other artists around the time that led up to and influenced this masterpiece. There was a whole section on the art of the Spanish Civil War. That is one conflict I feel I have never really understood properly. It’s always been talked about, written about, painted about, but its legacy lived on right through the end of Franco and probably beyond. Being in Madrid for the first time, I felt a sense of urgency that I need to educate myself about this civil war and about the people of Spain, which I think is a much more complicated country historically than many non-Spanish people know. So, I need to start doing some reading. If our trip to the Reina Sofía has done anything it has made me resolve to learn more. The other thing I enjoyed about the Reina Sofía was the abundance of works by that other great cubist, Juan Gris. I used to love Juan Gris when I was an A-Level art student, I did a project on him and we all went to see an exhibition of his work at Whitechapel. My favourite thing about him though was all the jokes I could use with his name, all really based on either being Hungry or Angry. As I repeated quite often, “Don’t make me Juan Gris, you won’t like me when I’m Juan Gris.” I bet Picasso and Braques used to say that to him all the time. Speaking of Pablo (well, you started it! ), we went to see a rather excellent exhibition in a large stately home last week (http://thegloss.ie/see-inside-picassos-world-at-castletown-house-this-summer/). Fascinating glimpse into the artist’s life. You’d find lots to sketch there as well. And of course, Dublin still has plenty of legacy Victorian ironwork and old buildings to be explored and committed to paper. We took advantage of the free opening hours and two day tickets and ended up going to Reina Sofia three times – and we still didn’t see everything. We also made a beeline for Guernica, as we had see the exhibition at the Picasso museum Paris of the prelude to painting it. My husband got a bit obsessed so we did several sketches each time we visited. Not only do I love the content of this – I’m travellin​g there next week and looking for suggestions – but I also love your layout! 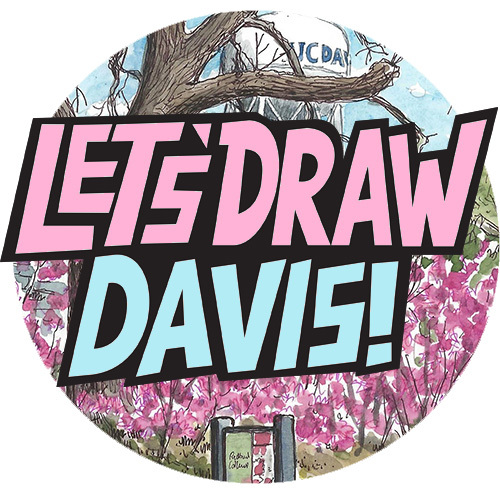 The drawings are such a neat tou​ch, and very well done. I particularly loved your sketch of people; if that doesn’t capture the heart of a city, I don’t know what does!